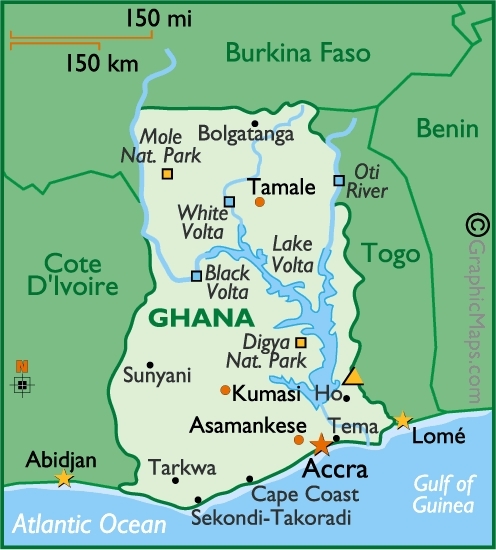 Our three week visit to Ghana started in Accra. 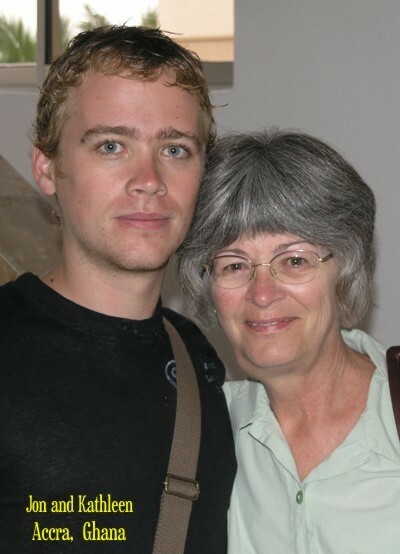 After landing at the airport, and checking in to the Central Hotel, our first stop was Duncan's - a favorite of the Peace Corps Volunteers in Ghana. 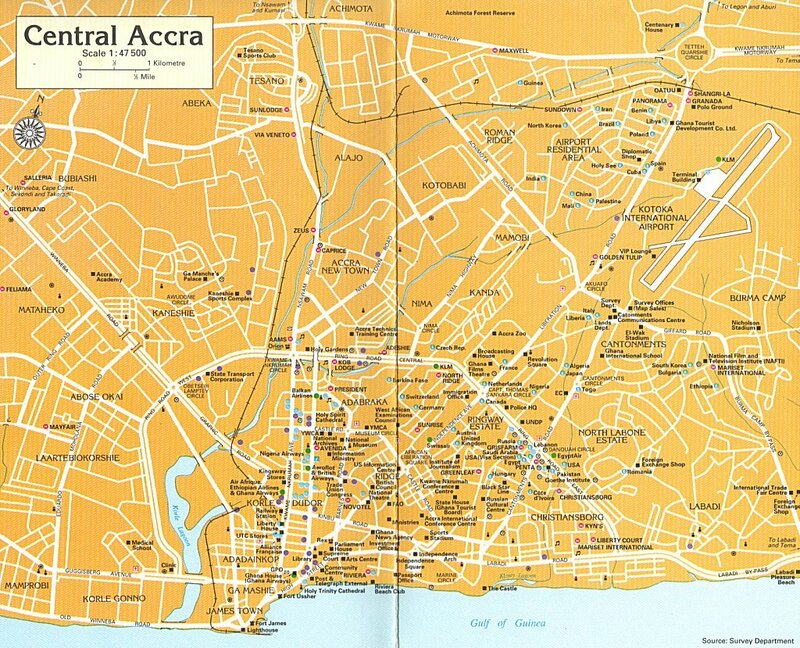 Click on this map to see a full size street map of modern Accra. If you go, don't even think about driving yourself. It is not worth it. Kathleen best described the traffic situation on the roads in Ghana - it's "organized chaos" and sometimes not so organized. Come back to this page soon and I will have a bunch of pictures and some text on Accra. In the meantime, here is the final text and picture for the page. I work backwards sometimes. And yes, I do have a weird sense of humor. We traveled in Ghana for three weeks and spent our last two days in Accra at the very nice, upscale Hotel Shangri-La. Inside the hotel compound, you would not know you were in Africa. In fact after our three weeks with Jon we were glad we had not spent all our time in Accra in a hotel like this one. We would have missed so much. On the other hand, I must admit, we enjoyed the air conditioning, running water, hot showers and the beautiful pool. After resting up, we flew back to America. 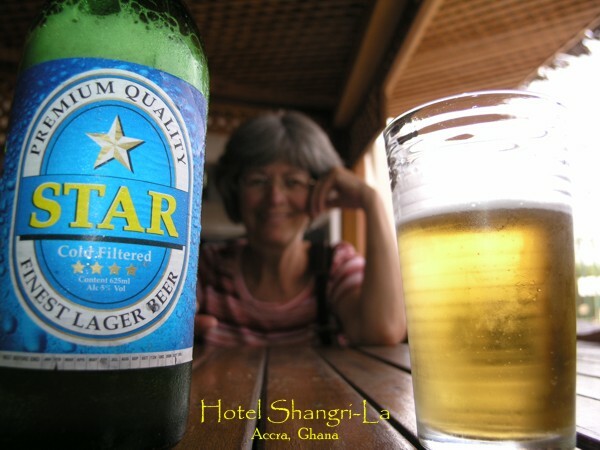 At the hotel, I took a photo of the a bottle of Star beer with Kathleen in the background. Using an f-stop of 2.3, it created a nice shot, with the beer in focus and Kathleen blurred a bit. 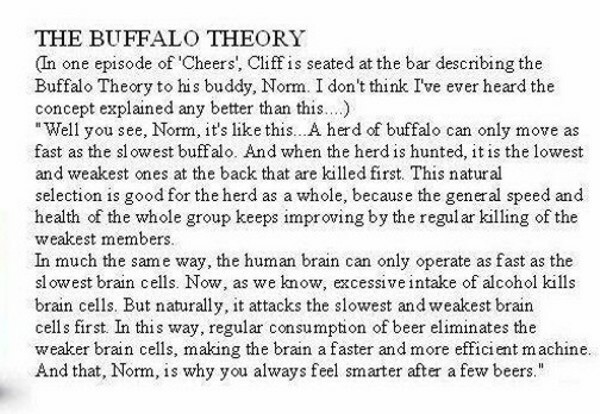 When we got home to Wisconsin, I found this e-mail joke about the Buffalo Theory. Seemed to make sense to put them together. Hope you get a smile on your face after reading.